One executive recently reported online that he had solved this problem by switching back to something he had used as a child – a pen and notepad. He felt it gave him more control than the various apps he had tried. And he can jot down the things he has to do on a daily basis. Most people seem to experience the same problem. I solved it in my life by developing the Taylor Planner some 30 years ago; but some people feel their jobs are too volatile to actually schedule blocks of time in their planners, electronic or otherwise, and stick to a fixed schedule. My son, Jason, is one of those people. Besides managing a restaurant and operating a website design business, he also runs the day to day operations of our Taylor in Time partnership. He extended the notebook idea to form a Daily Priority Pad (available in two sizes) which allows him to start each day with a clean slate. It’s a cross between a plain note pad and an actual planning calendar – with space for the day’s priorities, things that must be done that day, appointments, and follow-ups arising from phone calls and email messages and room for notes. It even has a Back Burner section where he can park items that come up during the day that can wait until the next day or later. I tried using it myself, and it works well. But I had two or three pages going at the same time since I’m in the habit of spreading my total workload throughout the week. So I reverted back to the paper planner. 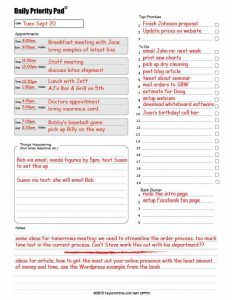 But I can see that this simple planning pad can be more than enough when you also use a handheld device or tablet to organize most of your week. One thing is certain. Regardless of how much you’re into technology, you can’t get away from using paper – even it involves jotting notes on scraps of paper or sticky notes until you get a chance to record the information into your smartphone or laptop. So you might as well do it in an organized manner, all in one place. 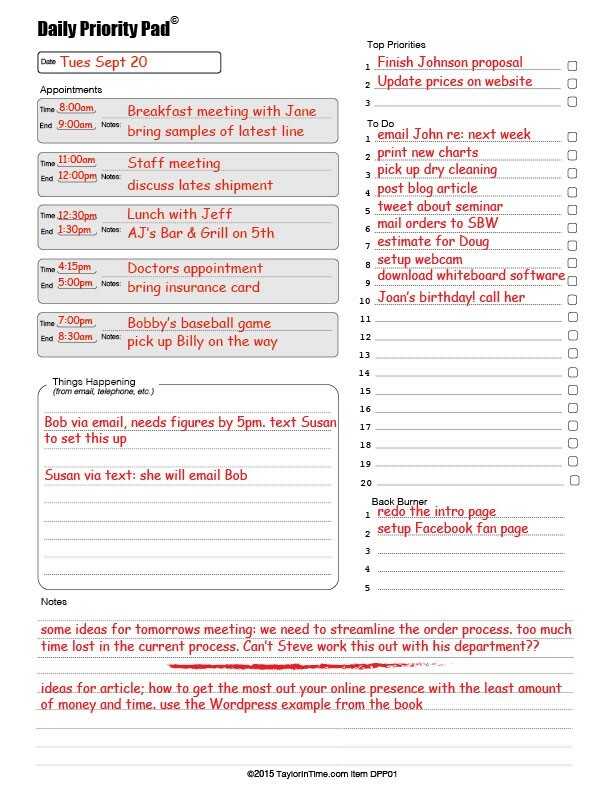 You can take a look at this new Daily Priority Pad at our website, taylorintime.com. You can even watch a brief video that Jason uses to explain how it works – and print off sample pages at our website as well. No sense in fretting about the things you have to do in the future. Take one day at a time. Don’t be so quick to say yes. People who claim they can’t say no are actually saying no when they say yes; because they can’t do everything. There’s only so much time available. And every time they say yes to something, they’re saying no to something else. And that something else might be time to spend on their family, friends or themselves. 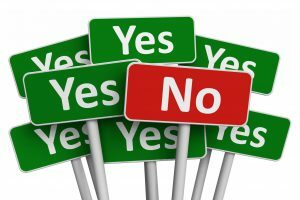 In most cases we don’t say no because it is easier and more rewarding at the moment to say yes. It’s called the “Pleasure Principle”. We tend to avoid pain and seek immediate gratification. When we say yes, we get immediate rewards – we feel good, we make people happy, we are liked, and so on. It’s the same thing with procrastination. We tend to do what’s pleasant and avoid anything that’s unimportant. When we procrastinate, we put off what we want most in order to do what we want at the moment. Brain research now offers another reason for our tendency to say yes so quickly. Saying yes is in most cases a knee-jerk reaction. It is an automatic response initiated by the same part of the brain the reacts so readily to interruptions and distractions. But our executive function – located in the reasoning part of the brain, the prefrontal cortex – can override this initial impulse if allowed to do so. And you can allow it by simply making up your mind right now that you will pause whenever asked to do something. It may be appropriate in many cases to respond during the pause with “Let me think about it” or “Leave it with me.” Or you may decide to say yes fairly quickly due to the nature of the request. The important thing is the pause that gives your executive function a chance to do its job. We have known for many years that giving of your time, money or talents is healthy for the giver. It has been linked to lower stress levels, increased physical and emotional health, an enriched sense of purpose and even longevity. But according to research referred to in an article appearing in the November 15, 2015 issue of Tampa Bay Times, even the thought of helping someone helps the giver fight off disease, among other benefits. A study at Harvard actually showed that such thoughts increased protective antibodies in the people who were considering helping someone. That’s what you are doing during the pause – thinking about helping someone. But the reaction is not reversed if you decide not to.